A Logger component, in addition to the message, log level and category section (which I have included in the Global Configuration section) must have, with Huong Dan Java Logger, I’ll add another section related to overriding the values of Category and Correlation Id that we configured in the Global Configuration section. Whether overriding or not is optional, due to user needs. The value of these cells, by default, will be the value from the Global Configuration section. First, we need to rename the method to be annotated with the @Processor annotation and delete the current argument of this method. This method name will be the name that appears in the Operation section of the main configuration of our connector. Here, I added a new LoggingLevel class to define the log level for the Huong Dan Java Logger. 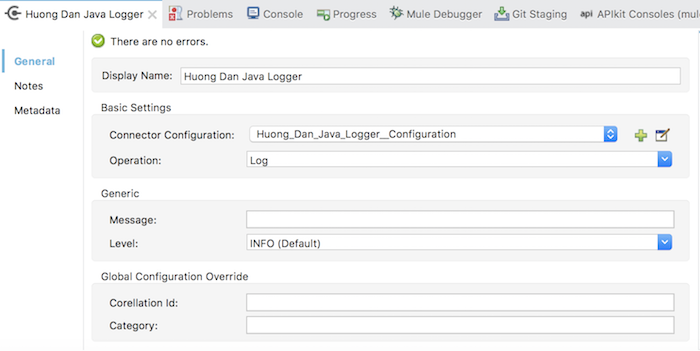 At this point, we have completed the UI for the main configuration of Huong Dan Java Logger.